My righteous one will live by faith; and if he draws back, I have no pleasure in him. 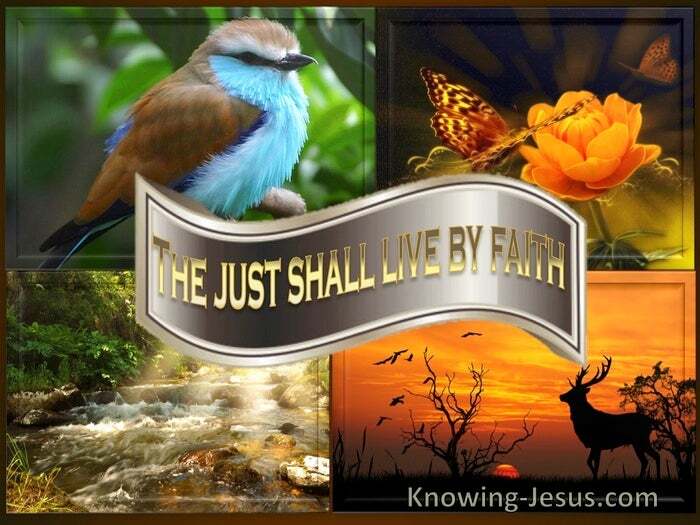 Once in the Old Testament and three times in the New Testament we are told – the just shall live by faith. The righteous man shall live by faith – a life of complete dependence upon God. My righteous servant shall live by faith – a life that rests its entire trust on the Father. It is through faith that a righteous person has life – a life of dependence on the Lord. The righteous shall live by his steadfast life – a life of complete trust on God. In Habakkuk we see that unwavering trust in God is the main focus of the passage.. no matter what the circumstances nor what difficulties are pressing in on our lives. In Romans the main focus is on righteousness – of the one living by faith.. and how those with faith in God are credited with Christ’s RIGHTEOUSNESS. In Galatians the main focus is on life – of the righteous person LIVING by faith, and how faith frees us from curse of the law – so that we can LIVE by trusting God. In Hebrews the main focus is faith –for it is by FAITH that the righteous man lives.. for without faith it is impossible for the believer to live a life pleasing to God. 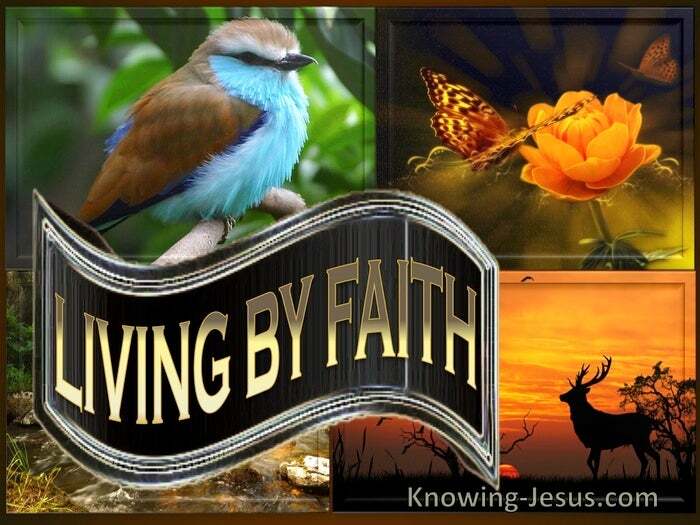 Without faith it is impossible for the Christian life to produce fruit of righteousness. Without faith it is impossible to show forth righteousness, which is of faith. Without faith we can’t sow, pursue or reap a harvest of the fruit of righteousness. OH! we were sealed with the Spirit’s seal of righteousness when we were saved. but living a life of righteousness can only be lived by faith – dependence on God, and of course faith has no merit on our part – for it is ALL by God’s grace. Godly living – a righteous life is a life that demonstrates dependence on God – an unfailing dependence on the grace of God in every area of life and living. A righteous life is one that has come to rest entirely on God’s sovereign grace. It is a voluntary submission to Christ’s sovereign will, that becomes our firm resolve. It is the submissive will that excludes all personal honour in favour of His splendour. God has set-out His criteria for godly living clearly:– total dependence on Him, and when God has set His ground rules there is no compromise on His part. When a believer lives in total dependence on God, it is credited as righteousness. When we live in dependence on self we are not living by faith but our own standards. Total dependence on God is faith in Him : trusting His word : believing His promises, but it is more; even more; much more – it’s trusting Him to do what is right and best. Faith is trusting God in His infinite grace and wisdom to do what is best for you. This may mean having to go through difficult times without understanding why.. it may mean a cruel and painful loss – or the slaughter of your reputation – it may mean having to face a future that is ravaged by unknown elements, and faith is trusting God’s omniscient wisdom to be working all things for the best. We understand what God’s strength is about but His wisdom is so different from ours. Faith is trusting Him with your family, your needs, your health – your reputation. Faith teaches us dependence in Him to do what is best – no matter what the outcome. And Habakkuk last words in His revolutionary, faith-focussed book were: Even though the fig tree does not blossom, and there are no grapes on the vines; even if the olive harvest fails, and the fields produce nothing edible; even if the flock is snatched from the sheepfold, and there is no herd in the stall – as for me, I will rejoice in the Lord. I will find my joy in the God Who delivers me.